Paul Isakson has come out as the person behind the Don Draper Twitter feed. It wasn't AMC after all. Although it seems he is handing over the account to them now. I wonder if they will continue the story. I feel it might have lost some of it's allure now that we know the true story behind it. This type of extension into the social web won't work with every show or character but I can see this working again. It's the perfect medium for TV shows as a film doesn't have that prolonged interest. Will Smith Twittering from NY about the I Am Legend prequel for a year wont cut it. But characters filling in the gaps between episodes is fine. Paul Isakson has come out as the person behind the Don Draper Twitter feed. It wasn't AMC after all. Although it seems he is handing over the account to them now. I wonder if they will continue the story. I feel it might have lost some of it's allure now that we know the true story behind it. 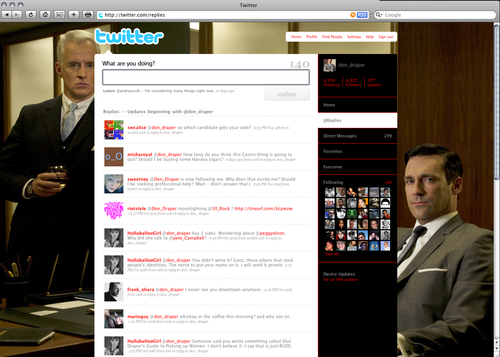 This type of extension into the social web won't work with every show or character but I can see this working again. It's the perfect medium for TV shows as a film doesn't have that prolonged interest. Will Smith Twittering from NY about the I Am Legend prequel for a year wont cut it. But characters filling in the gaps between episodes is fine.